If your clothes seem to have more static cling in the cold months of winter, you're not crazy. The lack of humidity makes it a lot easier for static electricity to build up. Fortunately, there are few things you can do to get rid of it. Photo by Leigh Anne McConnaughey. We've shared a lot of static cling solutions in the past: Putting on lotion, using aluminium foil or a safety pin in the dryer, and running a wire hanger along your clothes. Spritz a little water on your garment with a spray bottle on the "mist" setting. The moisture will attract any positive or negative charges. And washing your hair less in winter - so it accumulates more natural oils - will keep your hair from frizzing. Rub a dryer sheet on the clinging garment. You can toss one in your dryer if you want, but all you really need is a quick rubdown with a dryer sheet for it to work. You can even keep using the same sheet over and over for weeks. 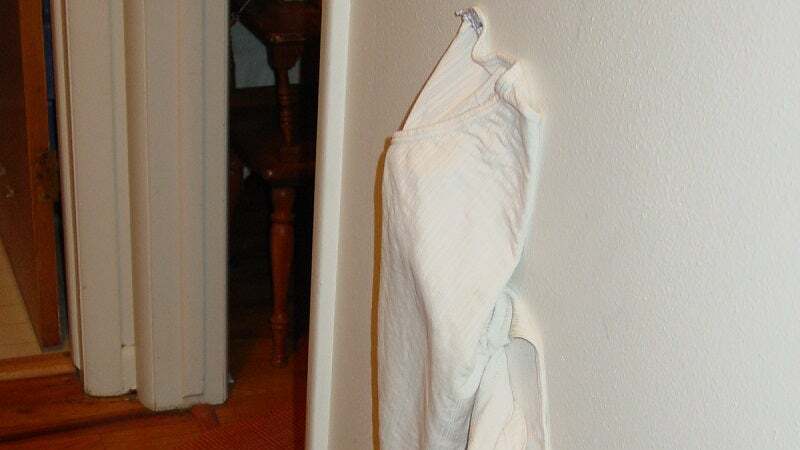 Throw a damp washcloth in your dryer for the last five minutes of its cycle. The moisture will soak up the static. Gently brush your clothing with a carbon fibre brush. The metal bristles will produce small discharges and create charged ions in the air that will remove the charge from your clothing. Now you can be free of the harsh clinginess of winter and move freely. If you want to learn more about what causes static cling, be sure to check out the link below.